Sets at Sunset Music Festival, a one day House, Techno, and Trance festival, just announced their final lineup. 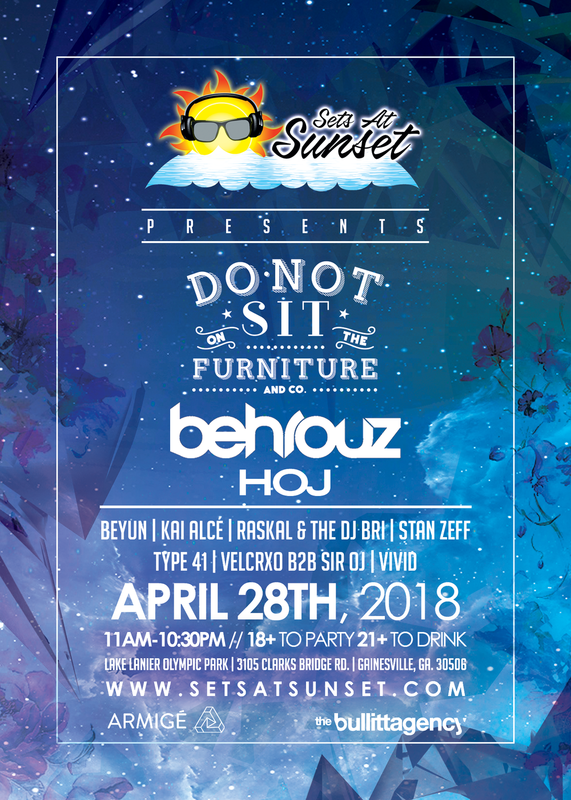 In an effort to do something new and different for Atlanta, they have teamed up with Do Not Sit On The Furniture to bring a little piece of Miami to Lake Lanier. They welcome Behrouz and Hoj as their showcase headliners. With local support provided by BEYUN, Kai Alcé, Raskal &amp; The DJ Bri, Stan Zeff, Type 41, Velcrxo B2B Sir OJ and VIVID. Ticket price increases to $40 on April 1st. Parking is available online for $7, and $10 at the door. Re-entry is not permitted after 5 pm. Cabanas are sold at $600 and $700 depending on proximity to the stage. broadcast van onsite with over 5 cameras, and VR capabilities so people can watch online. Sets at Sunset Music Festival is a 18+ event.